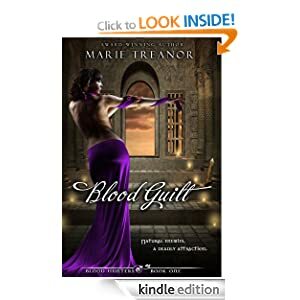 I liked Mihaela, though she seemed very fixated and stringent in her views on vampires – despite one saving her life and her best friend living with the current leader – I understood that by way of explanation of her upbringing. Orphaned by vampires killing her family she was befriended by the Hunters from a young age and drawn gradually into the group. Of course impressions formed at a young age shape much of what we believe when we’re older so its no wonder she felt as she did – and was so confused by the sexual feelings and dreams she had about Maximilian, the one who saved her life. It’s typical of her nature to involve herself in Robbie’s initial safety and then joining with Maximilian when Robbie is captured by Gavril. She’s struggling with the hunters, they are keen to work with the vampires that want to come out, they’ve reached a tentative agreement but her long time Hunter partner isn’t keen oh that idea, sees all vampires as needing to be killed and trying to persuade Mihaela to his view. She’s in Scotland taking time to to mull over the whole problem – but the problem seems to have followed her there! The vampires are split into two factions – those who like Maximilian want to come out, and alongside humans, and those like Gabril who just want to decimate and dominate humans. They don’t care what sort of destruction it will take to reach that state, and are very dangerous. I understood Maximilian’s initial torpor too, he’s hundreds of years old and looks back at the mistakes he’s made and seems to be feeling “was it all worth it?” Then he meets Mihaela, and is struck not by just her attraction but her nature, and the way she’s all out to help others, and slowly he gets her to trust him and she brings him back to enjoyment of life.